Some of our participants: (row 1) Ansie Baird, Charles Baxter, Marvin Bell, Robert Bly, Bill Butler, Michael Casey, Albert Cook, Robert Creeley; (row 2) Carl Dennis, Phil Dow, Cornelius Eady, Raymond Federman, Irving Feldman, Gail Fischer, Manny Fried, Carol Frost, Allen Ginsberg; (row 3) Ann Goldsmith, Mac Hammond, Esther Harriott, Lee Harwood, Robert Hass, Barbara Hollander, Anselm Hollo, David Ignatow; (row 4) Erica Jong, Shirley Kaufman, Judith Kerman, Milton Kessler, Carolyn Kizer, Allen Kornblum, John Logan; (row 5) Felipe Luciano, Morton Marcus, Bill Matthews, J.F. 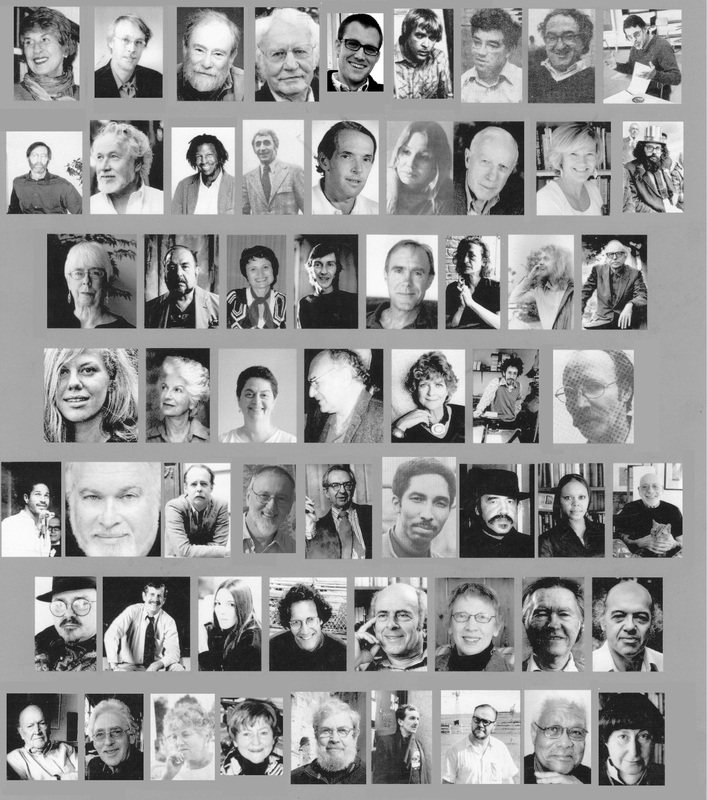 Nims, Raymond Patterson, Pedro Pietri, Carlene Polite, Martin Pops; (row 6) A. Poulin, Jarold Ramsey, Sherry Robbins, Mark Rudman, Louis Simpson, Judith Slater, William Stafford, Gerald Stern; (row 7) William Sylvester, Andrew Taylor, Virginia Terris, Rosmarie Waldrop, John Wieners, James Wright, Al Young, Harriett Zinnes. Not pictured: Mindy Aloff, Grace Amigone, Dennis Anderson, Frank Antonazzi, Arthur Axlerod, Nancy Barnes, Rafael Barreto-Rivera, Ahn Behrens, Jeremiah Rush Bowen, Ken Brauchler, Bill Cirocco, Martin Cohen, Barbara Copley, Robert Daly, Allan DeLoach, Byron Dibble, Paul Dutton, Doug Eichhorn, Alan Feldman, Jean Foster, Bernhard Frank, Jimmi Gilliam, John Gill, Daniela Gioseffi, Lyle Glazier, Jim Guthrie, Anna Hammond, Margaret Henderson, John Howell, Travis Howell, Bill Jungels, Dave Kelly, Charles Levendowsky, Michael S. Levinson, Peter Levitt, James Luke, Dennis Maloney, Jim Mann, Gary Margolis, Charles Martin, Stephen McCaffery, Jim McClurkin, Liza Mesiah, Charles Molesworth, Terry Moore, William Morris, Dan Murray, Joan Murray, William Navero, Pol Ndu, bp Nichol, Tom O'Leary, Rick Papenhausen, Frank Parman, James Paul, Tony Petrosky, Linda Phillips-Palo, Anthony Piccione, R.D. Pohl, Shreela Ray, Mary Richert, Edna Rivera, Kathy Rudy, Kevin Saviola, Boria Sax, Peter Simpson, Ed Smallfield, Jayne Lyn Stahl, Gary Storm, Rob Swigart, C.W. Truesdale, Charles Wattenberg, Burton Weiss, Stephan P. Wickert, Howard Wolf, Bill Zavatsky, Dan Zimmerman.